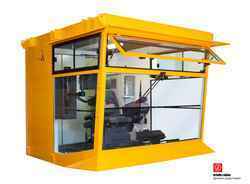 Leading Exporter of crane cabins for sts, rtg and rmqc cranes, crane cabins for steel plants and hot metal handling cranes, crane cabins for material handling industry, crane cabinets for steel plant cranes and crane and machine control stations from Mumbai. 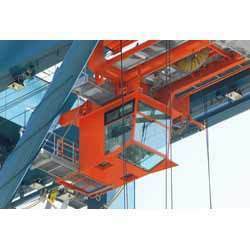 We are one of the leading manufacturers of Crane cabinets for STS, RTG and RMQC Cranes. All measures regarding the designs of our cabinets including choice of materials, operative functions, and mechanical loads and working environment are carefully analysed. The cabin is equipped with front windows for easy cleaning. The frame of the cabin consists of electronically welded steel and it is thermally insulated as well. 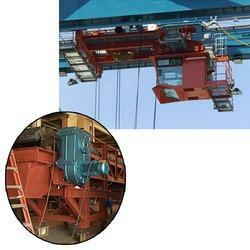 We manufacture Crane Cabins for Steel Plants and Hot Metal Handling Cranes. We make our cabins in a way so as to be suitable for both steel plants and hot metal handling cranes. 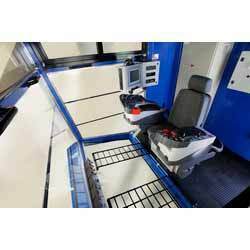 A crane operator's main requirement regarding a cabin is good visibility along with a convenient handling system. We ensure to provide the same. Our supreme quality cabins are manufactured and supplied to Europe and America as well. We are among the leading manufacturers of Crane Cabinets for Steel Plant Cranes crane cabinets for all machines, steel plant crane, RMCQ, STS cranes, RTG Crane, RMQC, Over Head, Tower Cranes, Mobile Cranes, Ship On Board Jib Cranes, and Mining Machines are available in various sizes to meet the requirements of our customers. The material selection for each cabinet depends entirely on the type of installation. Emco provides its customers with an extensive range of Crane and Machine Control Stations for stackers, cranes, port cranes, yard cranes, bucket wheel machines, STS cranes, RTG cranes, and RMQC cranes. All the cranes are equipped with overload protection devices, voltage protection functions and emergency stop systems so that they are not damaged easily. Control stations are made dynamic to meet all the requirements. These dynamic control stations have been proven to be the leading control stations for all types of crane applications. 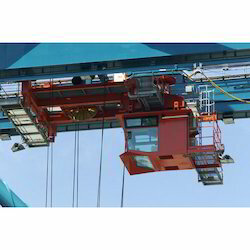 Looking for Crane Cabins and Control Stations ?